How to create a Training Process Flow Chart? An easy way to start completing training process flow is to download this example Training Process Flow Chart template now! Instead, we provide this standardized Training Process Flow Chart template with text and formatting as a starting point to help professionalize the way you are working. Our private, business and legal document templates are regularly screened by professionals. If time or quality is of the essence, this ready-made template can help you to save time and to focus on the topics that really matter! 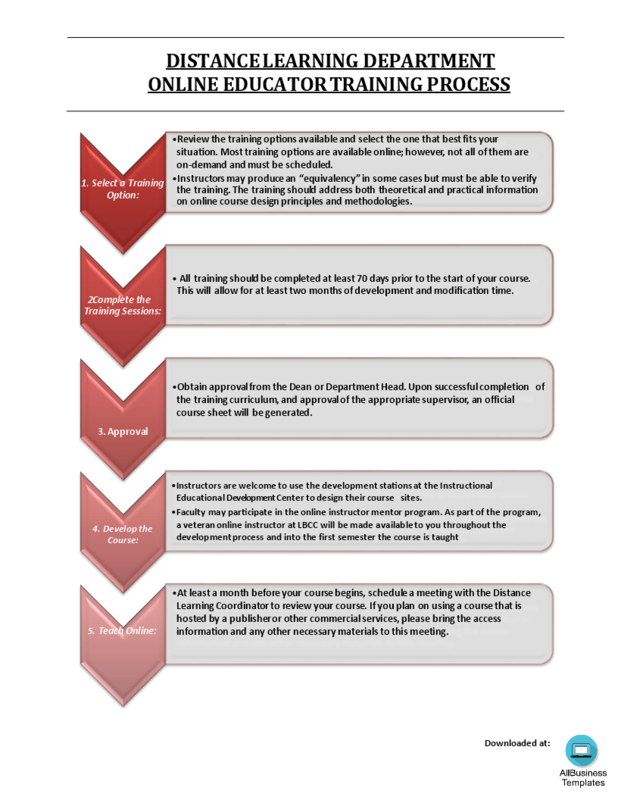 Download this Training Process Flow Chart template now for your own benefit! DISTANCE LEARNING DEPARTMENT ONLINE EDUCATOR TRAINING PROCESS •Review the training options available and select the one that best fits your situation.. As part of the program, a veteran online instructor will be made available to you throughout the development process and into the first semester, the course is taught •At least a month before your course begins, schedule a meeting with the Distance Learning Coordinator to review your course..